I am a post-doctoral research associate in Ecology & Evolutionary Biology at the University of Arizona, working with Dan Papaj and Anna Dornhaus. My primary interests are centered in pollination ecology. I am especially interested in how floral traits of different modalities vary with respect to pollinators and the cognitive aspects of pollinator preference towards certain floral traits. I am also interested in how innate preferences can change over time, as different cues are learned. I studied gustatory variation (nectar traits) in wild tobacco species during my graduate studies at the University of Missouri-Columbia, under Timothy Holtsford. I further investigated visual and olfactory variation between these species during my postdoctoral work with Robert Raguso at Cornell University. While there, I also examined innate responses of hawkmoths to these wild tobacco species, exploring likely floral traits that contributed to overall attractiveness and/or facilitation of foraging. I collaborated with Candace Galen and Robert Raguso on a project aimed at determining how olfactory variation affected both pollinators and illegitimate visitors of the alpine skypilot in the Rocky mountain tundra. 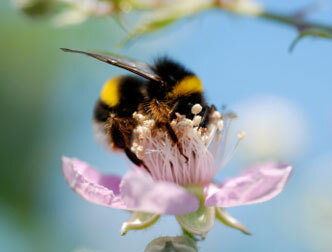 I am currently investigating how bumblebees learn complex floral traits. All contents copyright © 2003-2008, Arizona Board of Regents.